A delightful 3 Tier Organic Diaper Cake makes an unforgettable baby gift for a mom to be. Completely made from scratch and exclusive to GrowInStyle, this Yellow Polka Dot Diaper Cake is an impeccable baby gift for parents who choose not to find out whether they are having a baby boy or a baby girl. Bring along with you to the hospital, send as a corporate baby gift to an expecting coworker, or decorate a baby shower with this stunning centerpiece, this diaper cake makes a terrific new baby gift. 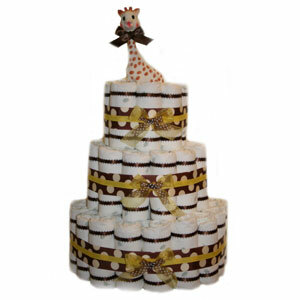 To upgrade this diaper cake, please select the option "Diaper Cake Upgrade" below.